Calling all fans of laughter, comedy and everything funny! 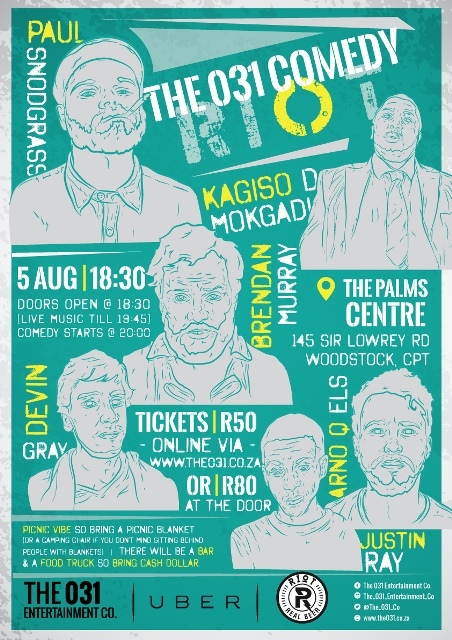 The 031 Entertainment Co has put together their first side splitting funny Cape Town comedy shows starring some of Cape Town’s funniest comedians. Read more about 031 Comedy Riot. Kagiso or KG as he is affectionately known is the quintessential comedy heavyweight. He’s shows include, The Funny Festival 2012, Keeping You In Stitches with Riaad Moosa, The Marc Lottering Roadshow, Blacks Only Comedy Show and many more. David Kau and Nik Rabinowitz have entrusted him to be the opening act for their one man shows. Brendan Murray talks. A lot. Luckily, he thinks almost as much and his jokes tend to have more to do with the real world around him than the imaginary one where midgets ride flamingos to war in his head. From politics to police to the fate of deaf T-Rexes Brendan eventually covers it all in surreal style. Paul Snodgrass has been a comic for over a decade working the UK and the US, as well as Comedy Central, he’s short, has a ginger beard and is a little loud but loveable. Devin Gray is one of the youngest working comedians in the whole of South Africa.. Performances in all of the major cities and interactions with the big names of South African comedy are all achievements that Devin can put under his belt. From jokes as simple as a family of balloons to hard hitting political satire, Devin’s Comedy is extremely diverse. Arno Q Els, is a multi talented functional drunk who has toured the country doing comedy and/or music on big stages. Including Soweto theatre, Heritage theatre, Catalina theatre, Splashy fen where in 2014 he did 11 show over three days and 2015 he hosted the main stage. We have partnered with Uber to get all guests to and from the event safely and in style! All new users can sign up here with the promotional code: The031 in order to receive a free first ride up to R150. To request your ride, simply download the free application for iPhone, Android, Blackberry 7, Windows Phone, or visit the mobile site: m.uber.com. The show will be held on the 5th of August at 145 Sir Lowrey Road, Woodstock. Doors open at 18:30 (live music until 19:45), show starts at 20:00. The Riotbeer Brewery will be supplying a variety of craft beer on tap and bottled. For more details on these comedy shows, click here or follow The 031 Entertainment Co on Twitter @the_031_co or like their Facebook page The 031 Entertainment Co. The tickets will be sent to you from Arno Els from The 031 Entertainment Co. I will not be responsible for the delivery of the tickets. The prize is 1 set of double tickets to 031 Comedy Riot and may not be exchanged for cash. Entries close at midnight on the 30th of July 2015. I will choose the winner at random on the morning of the 31st of July 2015. I will inform the winner via email. If the winner does not respond in 24 hours, I will choose another winner. Entries are open to all readers of this blog who can make their own way to the show. I will not be held responsible for non-receipt of your tickets. Disclosure: I was invited to host a giveaway on my blog as well as attend the show. This post is in line with my blogging policy. What a fun giveaway! We could all laugh a bit more and cry a bit less I think. Someday I vow to get to Cape Town. Seems like a riot. But for now, I guess I have to settle for Niagara Falls. Which is a pretty scrappy city on the US side, we sure have a lot of explaining to do! (not the falls, the neighborhoods) hello crime. Sorry you have crime in your area Laura! Sounds like fun! Good luck everybody! Sounds like a good show to attend. I don’t think I have been to one in ages!